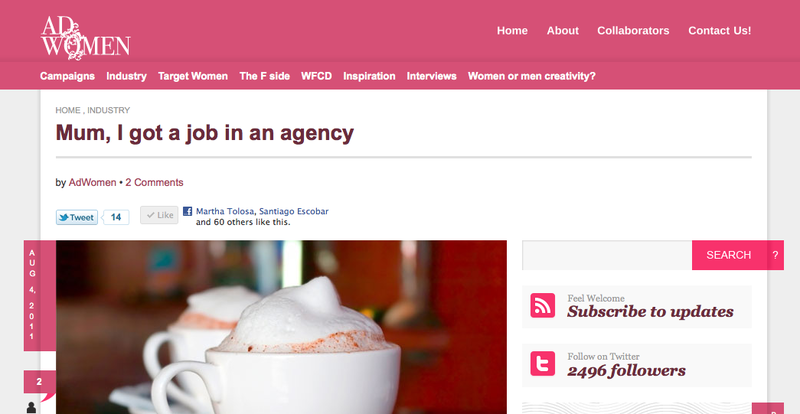 Early this year, I discovered a group on Linkedin called World Female Creative Directors. I started joining their chats and found interesting articles in their posts. They have a website called http://www.adwomen.org connecting their community with famous Creative Directors around the globe. The look is completely feminine, the design is delicate and flawless and the content is quite varied, it’s worth looking at. I wanted to write an article for them, but all the time I was delaying the task. Because I was busy with assignments, because I was looking for jobs, because I went out, because everytime there was an excuse. And I can tell you, there are thousands stopping us from doing what we want. Suddenly on my way to Barcelona for a week’s holiday, I remembered that I had to send the email to AdWomen, “Oh yes… I just remembered when I didn’t have any computer or Internet to work on”. Somehow that idea never left my head on holidays, therefore, as soon as I came back to London I sat myself at the table until I had written a decent article for them. When I finished it, I read it thoroughly and changed my mind. It looked like an article written by a WFCD and I wasn’t one of them yet. So instead, I decided to tell a different story, one of those experiences that people prefer not to mention in a job interview, not even to colleagues. What I call “Unsuccessful stories trying to get the victory”, you may have a couple, I know, everyone does. Should a Digital Marketing Program include jump training?